Arc is exactly right, Darius! If you are willing to give up PKing and no longer have a bounty, then we will consider you for membership! Please provide us a link to your profile. I should note that if you still have a bounty, it would have to be cleared before you become an actual member of 10 minutes from hell, but would not prohibit you from becoming an official potential member! I'm not sure if I have a bounty or not. How would I know that? Oh, and my coo-coo clock isn't fully wound, either. I'm currently scavenging Caiger Mall in Darvall Heights. I should be in your guy's area in a day or so. I need to find a tool box. I'll start looking for one right after I expend a few shells on some zeds! Do you guys transmit? What is your freq, and where are your main HQs? You check here: The Rogue's Gallery to see if you have a bounty. Go to the bottom of the page and plug in the numbers at the end of your profile link and hit search. In your case, we use 1181945 and there is no rapsheet for you so you don't have a bounty. Because the mods are a bit behind on entering PK reports, we might want to check back later on to make sure you don't acquire one. I'm going to add you to the potential members group here on the forum. This means that you will have access to an area of the forum that is away from public eyes. We can talk there. Reason For Joining: Wanted to go somewhere with more zombies with my alt. I foound you on the wiki and decided that I should try and join your group with my alt. I dont have a bounty because I just started the alt. I am dead at the moment and at Hanlon Park with 6 zeds. I am low level at the moment but, after a little while in Molebank I should level up a bit. I've added you to our potential members group so you will be able to see that area of the forum. The potential members group is not visible to the public, but all team members and potential members have access to it. It is a place where we can communicate more sensitive information to you and where we get to know you and you get to know us to see if you are a good fit for our group! 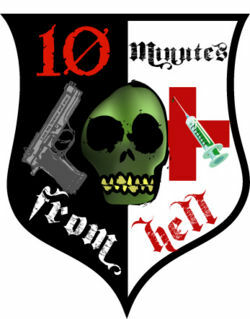 Looking to join 10mfh because I have delt with a few members in the past and liked them very much. Very active and team oriented. I've added you to the potential members list so you should be able to see a new, more private area of the forum. We'll communicate a bit more in that section! Character (currently dead) is named Wendy Testaburger; she has only ever been a member of one group in the past (the Imperium), and she has been working solo since leaving it. She has never PK'ed, or killed zombies at clearly marked revive points or cemetaries. I found your group through your advert on the Urban Dead Wiki. It appears that you may be just the type of team member we are looking for! I'm going to give you access to our Potential Team Members section of the forum. We'll get to know each other a bit better there so we (and you) can decide if you are a good fit for our team! LET'S STOMP ON THEIR GIZZARDS AND DRINK TO THEIR STOMPED GIZZARDS!!! IM 'THE MAIN MAN' MY ID # IS 1322827. SINCE VRIL DOX FINALLY MET HIS DESERVED AGONIZING ENDING, I'VE BEEN LOOKING FOR A NEW OUTFIT TO KICK AROUND WITH. YOUR ADVERT LOOKED MORE PROMISING THAN THE REST. ANYWAYS I WAS ONLY A FEW BURBS AWAY FROM YOUR STOMPIN GROUNDS. I'M HERE TO KICK, MAIM, FRAG, AND SHRED THEM ZOMBIE BASTICHES!!! I AM ALSO HANDY REPAIRING ALL MANNER OF THINGS, FROM BUILDINGS TO ENGINES. THOUGH I WOULD MUCH RATHER SKRAG ZEDS!!! I'LL BE PASSING THROUGH YOUR AREA IN THE NEXT FEW DAYS. DROP ME A FEW LINES IF YOU THINK YOU COULD USE MY EXPERTISE. I CURRENTLY HAVE A GENNIE AND FUEL IN MY ARSENAL OF DOOM. To be honest, we aren't in Molebank at this time. Molebank is in quite the state of ruin at the moment. We aren't very far away, though, so heading towards Molebank would still work. What is it about 10 minutes from hell that caught your interest? THE MAIN MAN SPEAKS AT A CONSTANT VOLUME, AND IT IS SET AT FRAG-ALL!!! IT MUST BE DUE TO UNBEARALBE PEACE I HAD TO ENDURE ON CZARNIA BEFORE I BLEW(LITERALLY) THAT POPSTAND. I CAN SEE WHY YOU LEFT MOLEBANK, WHAT A DUMP!!! I HAVE SEEN BETTER MAINTAINED TOILETS AT THE WORST OF SOME OF THE FUEL STOPS I'VE BEEN TO. SO WHERE IS YOUR EXPEDITION FORCE AT? I USED TO RUN WITH SQUADRON1111 BUT THEY WERE TOO SEDENTARY A GROUP FOR ME. SO I AM CURRENTLY LOOKING FOR A NEW BAND. I FIGURED TO GIVE YOU CREEPS A TRY SINCE YOUR BAND NAME AND CREST HAPPEN TO HAVE SEVERAL OF MY FAVOURITE THINGS ON IT: GUNS, FRAGGING, BLACK, RED, ZOMBIE SKULLS, AND FROM HELL (WHICH HAPPENS TO BE ANOTHER GREAT COMIC). I'M LOUD BUT ALL OF THE OTHER TROOPS SEEM TO BETTER FIND THEIR GUTS WHEN THEY KNOW THE MAIN MAN IS AROUND!!! Lois Millard wrote: Well, hello! I've given you access to our potential members area of the forum. It's an area where we get to know you and you get to know us. Hey, I'm Gog27. I've been a Malton City Zookeeper( Link to account: http://urbandead.com/profile.cgi?id=1339538 ) for the majority of my time playing Urban Dead but I took a lengthy break from the game a few months back and now that I've come back I can't seem to find any fellow Zookeepers . My friend and I have been hangin around the Zoo lately but now we wanna join a group and yours was the first one on the Wiki recruitment page so it seems like the best(easiest)choice! I'm maxed out (Though I refuse to get Headshot) and don't mind doing anything really, though I would prefer a Non-Combat role so my uniform doesn't get bloody ! Barricade patrol, Suicide repairs, Healing, Reviving, Radio Spamming(Kidding), Zed Killing or whatever it doesn't matter to me, I just want something to do. I'll add you to our potential members group. This will allow you access to a separate (and more private) area of our forum for those seeking membership in 10 minutes from hell! Please read the stick topics in that section and let us know if you have any questions! Howdy, I'm T Mc P. I was previously a Malton City Zookeeper with Gog27. Link to my account: http://urbandead.com/profile.cgi?id=1357217. I took a nice 3 month break from Urban Dead but now i'm back and there seems to be no more Malton City Zookeepers . Me and Gog27 have been stocking up on supplies and getting xp for awhile and we decided to join a new group. Yours was on the top of the wiki recruitment page...so we thought it would be a worthwhile group to be in. I would prefer a non-combat role aswell because of the stuff i'm wearing but if i need to I will. I can Barricade, Heal or whatever you need. I just need something to do . I will add you to the potential members group so you can view our potential members section of the forum! Hello! I'm looking to join your group. My UD ID is Johnathan 117. Profile found here. I've been with the game for almost 4 years, stopped playing in 2008, but here I am again. I've been in two groups, one of which I founded with my friends (S.T.A.R.S. you may have heard of us, but probably not. we defended lower Malton by west grayside and that whole area for a wee bit. We had a lot of allies, but I'd be damned to remember them right now haha) but that fell apart cuz they stopped playing. The other was a small PK hunting group that myself and one other person were in. But now that I'm back, I'm looking for a good group to join and play with and I dug this one the most. I found you guys through the "groups recruiting" link on my profile. I'm currently in Brooksville which isn't TOO far from Molebank. I think I'd be a great asset to this team. So let me know! You mention that you were a member of a PKer group. You do understand that 10 minutes from hell does not PK, right? Do you think you'll have a problem adjusting to being a member of a non-violent group? haha no, no, no. not like that. "PK hunter group" as in we hunted down PKers. Looking back, that was worded pretty badly on my part. Oh, well! I'm glad we cleared that up, then! I'm going to add you to our potential members group so you can see that additional area of the forum!